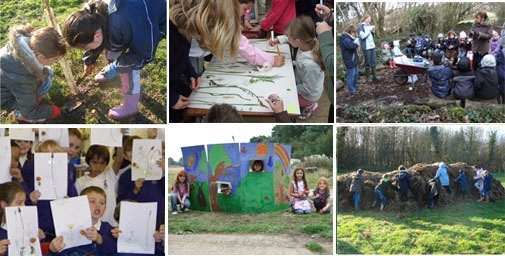 We provide a wide range of activities supporting the national curriculum and have worked with local primary schools in natural sciences, conservation design and technology, life cycles and discovery. Although we provide a structured visit to Naturezones our aim is to encourage the children to learn, explore and discover in their own ways. We have a wide range of activities to choose from. There are two main wildlife habitats - wildflower meadows and Carr woodland. You can choose to cover a range of activities from the habitats below or concentrate on one specific habitat. "Thank you so much for one of the most amazing days I have ever had with my class. The children loved their experience at Naturezones and were so chatty on the drive home, it seems like the hide-and-seek was the highlight of the day. For me the highlight was hearing them and seeing them becoming so excited and interested in the wildlife on their bug and flower hunt. What a gorgeous place you have and thank you. "We would be very pleased to return to Naturezones and have recommended it to other teaching colleagues as a place to visit with their children. Lots of parents have said that their children went home saying it was one of the best trips they have been on". St Thomas Primary School "The instructors were excellent, pitched just at the right level for my 4/5 year olds".